The Village of Mill Neck obtained a NYSDEC permit in late 2011 to manage the invasive Phragmites reeds growing in the marsh to the north of the DeGraff Causeway. 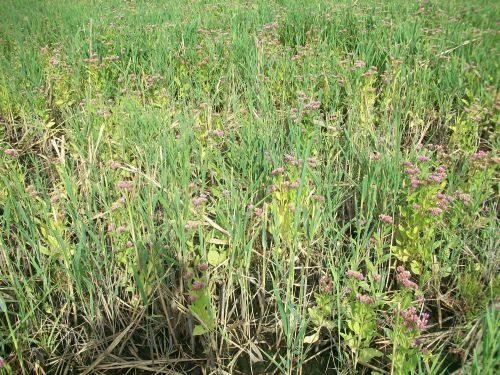 The NYSDEC permit (valid through 2016) authorizes the management of Phragmites through repeated cutting during the growing season. 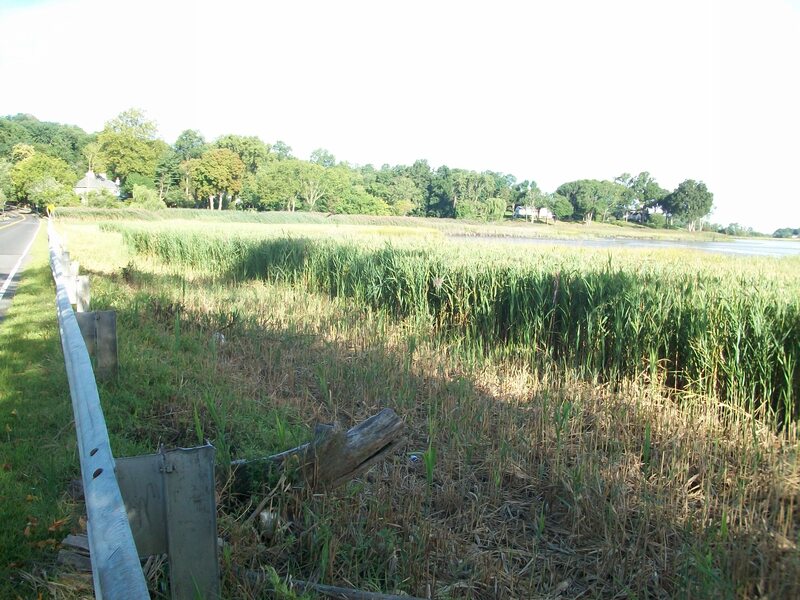 During cutting events, the Village’s contractor avoids cutting or damage to beneficial native marsh plants by cutting the Phragmites above the height of the native plants. This will allow the native plants to establish and eventually replace the Phragmites. Three cutting events were conducted between June and October 2012. Two cutting events were conducted between June and September 2013. A cutting was conducted on June 21, 2014. It is expected that the next cut will occur in early August 2014 and, possibly, another cut in September 2014. Prior to each cutting event, the Phragmites stand is inspected to determine the appropriate cutting height to avoid impacts to native vegetation. In 2014, due to presence of many sedge wren and red-winged blackbird nests, large areas were not cut to prevent disturbance to the nesting birds and any nests observed in Phragmites within the cut areas were avoided. After two complete seasons of repeated cutting, positive progress towards the management of Phragmites has been made. There has been significant growth of native plants in areas formerly consisting entirely of 8-12 foot tall Phragmites. Native marsh plants such as salt marsh bulrush, marsh elder, seaside goldenrod, sweetscent, salt hay, and spike grass have been observed growing in these Phragmites stands. Some photos of the re-colonizing native plants are provided. Phragmites stand in 2010 prior to the project. Seaside goldenrod re-growing within the Phragmites stand in 2012. Sweetscent re-growing within the Phragmites stand in 2013. 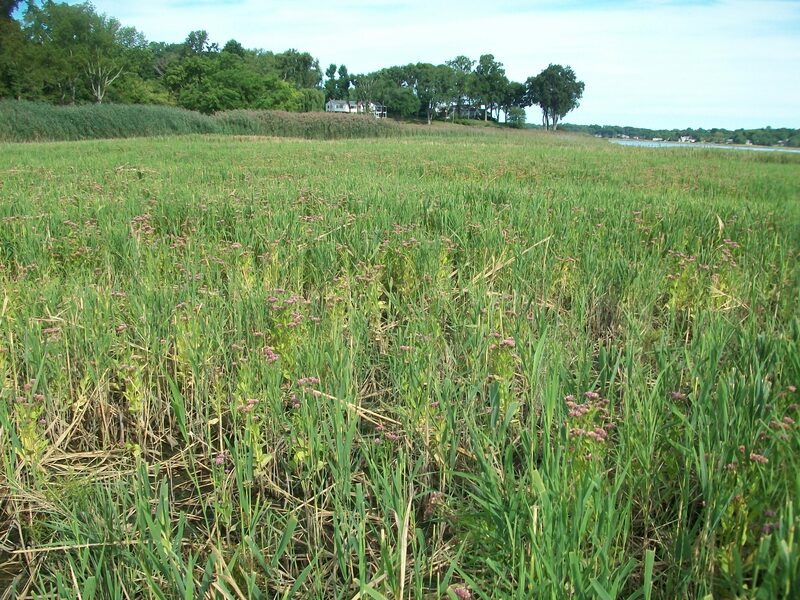 Sweetscent re-growth with unmanaged Phragmites in background in 2013. View of Causeway road edge in 2013.